The Edalji Case. 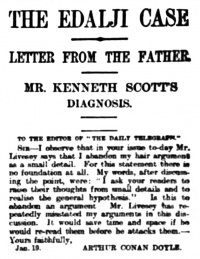 Letter from the Father is a collection of 8 letters published in The Daily Telegraph on 21 january 1907 including one written by Shapurji Edalji, George Edalji's father, one by George Edalji himself, and one written by Arthur Conan Doyle. Below is reproduced the Conan Doyle letter only. The Shapurji Edalji's letter is here, and the George Edalji's is here. This page was last edited on 27 September 2017, at 22:54.